Merck & Co.'s Keytruda jumped further in front of its rivals Monday, as the company announced European regulators approved the blockbuster cancer drug as a first-line treatment for a common type of lung cancer in a combination with two chemotherapy drugs. The European Commission gave the OK for Keytruda in metastatic nonsquamous non-small cell lung cancer (NSCLC) for adults whose tumors have no EGFR- or ALK-positive mutations when used as a combo therapy with Eli Lilly's Alimta and platinum chemotherapy. Keytruda is now the only anti-PD-1 drug approved in Europe in the first-line NSCLC setting as part of a combo regimen. As such, it "adds to the rapidly growing role of Keytruda as a foundation for the treatment of lung cancer," said Roger Perlmutter, president of Merck Research Laboratories, in a statement. Keytruda (pembrolizumab) continues to dominate in first-line NSCLC approvals, which have fueled its rapid sales growth and transformed Merck into an immunotherapy leader. This latest approval gives Merck the opportunity to further cement that position, which could in turn put added pressure on rival Bristol-Myers Squibb. The two pharmaceutical giants took different strategic paths with their blockbuster I/O treatments. Bristol-Myers unsuccessfully tried to first win a first-line approval in a broad group of NSCLC patients, while Merck took a more tailored approach, aiming for a first-line approval in patients with greater than 50% PD-L1 expression. Fast forward two years, Merck's approach has won out, allowing Keytruda to catch up to — and recently overtake — Bristol-Myer's Opdivo (nivolumab) in overall sales across cancer types. 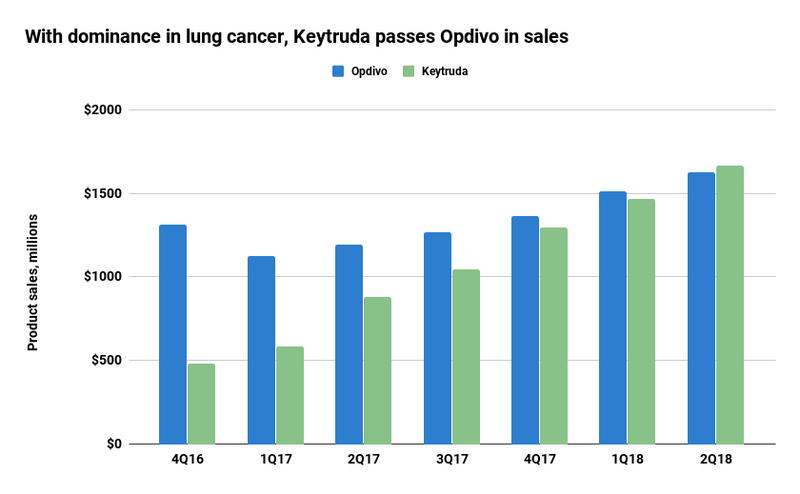 Last quarter, Keytruda sales were $1.67 billion versus Opdivo's $1.63 billion. With the race still tight, both companies have doubled down on combo parings to build out the labels of their respective drugs. Merck's found success combining Keytruda with chemotherapy, while Bristol-Myers has focused on showcasing the efficacy of Opdivo added to its other immunotherapy, Yervoy (ipilimumab). Predictably, Keytruda has become an increasingly bigger percentage of Merck's total revenue, steadily growing from making up 7% of total pharmaceutical sales in early 2017 to about 18% last quarter. Sizable sales numbers should only continue to grow, analysts estimate. The PD-1/PD-L1 drug class is expected to reach $21 billion in sales next year and exceed $44 billion in 2024, according to a Sept. 4 report by analysts at the investment bank Cowen & Co. Lung cancer is by far the largest segment, with Cowen estimating $23 billion in 2024 sales for PD-1/PD-L1s in that disease area, followed by melanoma at $5.4 billion. Cowen anticipates Merck will lead the way in the drug class with $19.7 billion in sales in 2024, followed by $13 billion for Bristol-Myers Squibb. Combined, the two companies are expected to make up roughly three-quarters of worldwide sales for PD-1/PD-L1 inhibitors by that point. For now, Bristol-Myers finds itself needing to make up ground with Opdivo. 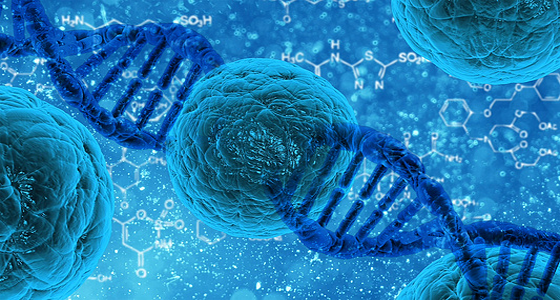 In May, the company announced the European regulators agreed to review Opdivo plus Yervoy as a first-line NSCLC treatment for patients with high expression of a biomarker known as the tumor mutational burden. Those two drugs are also under review for the same indication in the U.S.